My husband and I started this business with the intention of providing a professional service built on honesty and quality. We do not believe in misleading sales tactics or gimmicks. Our technicians are highly trained professionals and are not paid on commission, so you don’t have to worry about high-pressure sales or being sold something that you don’t need. In an industry that is ever-changing, it is important to keep up on current codes and industry standards, which is why we invest in continuing education for all of our employees on a regular basis. Our goal is to provide an honest service at a fair price. 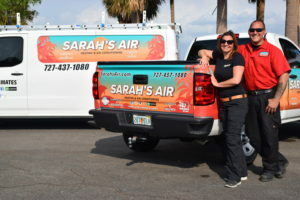 Sarah’s Air was developed by a woman with women in mind. How do you know if what you are being told is the truth? Without knowledge, all you can do is guess whether or not the person talking to you is trustworthy or not. The more interaction you have with someone, the more you can tell whether they are knowledgeable or feeding you a line. So aside from becoming an expert what can you do? What if you knew the right questions to ask, even just a few to help you know if the person talking to you is knowledgeable or not? That’t why we are different. We want you to ask questions, as many as you want so you can get the best product for your individual needs. © 2019 Sarah's Air LLC. All Rights Reserved.